LAS VEGAS — Working towards making a comeback after undergoing Orthokine therapy on both knees in Germany, Jermaine O’Neal said it was difficult to accept his limited role in his the Celtics offense the past two seasons. O’Neal worked out for the Los Angeles Lakers on Tuesday at Impact Basketball Academy and spoke with the Globe following the session. After averaging at least 10.6 shots per game – and a career-best 19.4 in 2004-05 – for 12 consecutive seasons, O’Neal attempted 4.5 in 2010-11 and 4.8 in ’11-12. “When I was asked about (offense), I tried to be as professional about it as possible but it’s hard,” he said. “You put any player in that position and ask them how that’s going to pan out for them; it’s hard mentally because you’re fighting against yourself every single day. And it’s not like you’re getting the reps, even in practice, because they’re gonna stay away from that in practice because they don’t want you to start leaning towards that in games. It was really rough. The things that kept me going was the guys on that team, (team president of basketball operations) Danny Ainge and just the passion of that city. No one wants it to end the way it ended, but it did. I was never really healthy mentally. The Celtics were 95-53 in O’Neal’s two seasons in Boston and 24-25 in games he played. 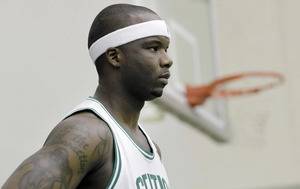 O’Neal carved a niche defensively with the Celtics by taking charges and grabbing rebounds but his first season was cut short by left knee surgery. And a hard fall taking a charge from Dallas’ Dominique Jones ended his final year because of a damaged wrist. “I don’t have regrets for that because I had a great time,” he said. “I had a great time with the guys that were out there, it helped me get from day to day. And Danny Ainge, I can’t speak enough about his position as president of the team.